This photo shows a severe fire damage we were called out to help with. Someone fell asleep with a lit cigarette causing extensive damage. Fortunately, everyone was able to get out of the home safely. A guest on the 4th floor of this hotel left his bathtub faucet running and fell asleep. Eventually the tub filled and water overflowed to all 3 floors below. We were able to arrive quickly and restore many of the building materials without demolition, which helped limit costs to the building owner. 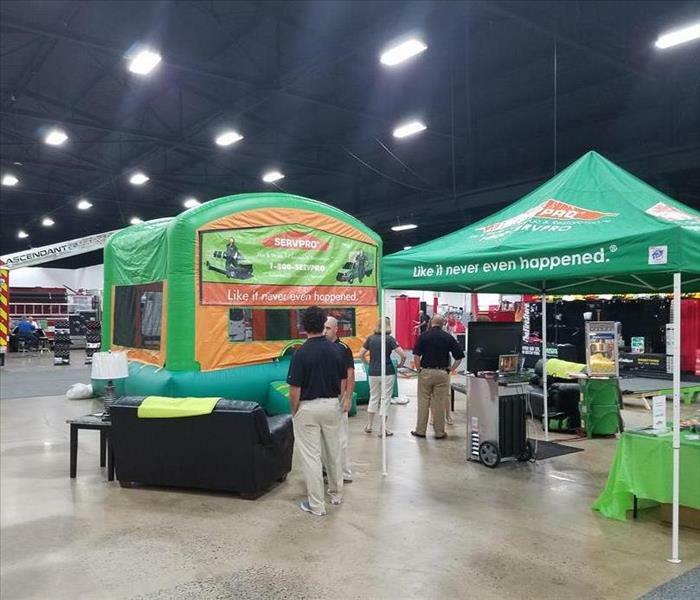 This is a photo of a joint effort among local SERVPRO franchises to support firefighters at the Keystone Firefighter Convention. SERVPRO of Langhorne/Bensalem wishes to thank and support all first responders in our community! In this photo, you can see a small portion of a commercial water mitigation. We had to place a significant amount of equipment in the cafeteria in order to dry out the property effectively. This is a photo of our warehouse. You can see that we have a significant amount of equipment so that we can handle any size disaster. We also have plenty of room to store customer contents in case they need storage during restoration.